Communication with the outside world impossible either because of a storm, cut lines, or they’re on an island. A killer lurks. Who is it? Each person has his or her own personality quirks or suspicions. Of course, they don’t all get along. In fact, one or two of them are down right insufferable. This is perfect for stories because the ticking bomb is built into the premise, along with the tension. But at the same time, character development is crucial. This past week, I had the great pleasure of attending The Mousetrap based on Agatha Christie’s novel, at my local theater. I am very proud to say that I solved the murder before the killer was revealed. I just chose the person least likely to be it and the solution appeared. Though, I don’t think that would work with more modern stories. I think about Across the Universe by Beth Revis, and soon-to-be-released Ten by Gretchen McNeil. I love attending my local theater especially since my daughter participated in the junior intern program all summer. Something about the theater is awe-inspiring. I love seeing how they build up to a reveal or an intense emotional moment or how they make something even more hilarious through hyperbole. Of course, as writers, we all know how studying movies helps us with our storytelling so watching theater helps too. But I loved spending time with my daughter too, who loves theater. Seen any musicals or plays this summer? Which one is your favorite? ← Hope is like a giant carnivore. Haven’t seen a play or musical in years. Glad you figured out the killer! I’ve seen Mousetrap 3 times – with 3 different killers in the end 🙂 At one school I taught at years ago, we took kids to a larger city for a year end trip. 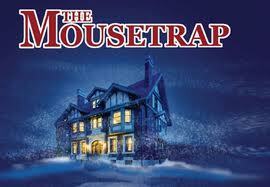 We saw Mousetrap every year. The cast had multiple endings to the play so you never quite knew how it was going to go. I used to read most of the play before we went and leave them hanging then finish it when we got back. Lots of fun! Haven’t seen one in years like Alex. That’s awesome you figured it out. You’re a born mystery writer. I can see how anyone of them could be killers. What a great idea! To read the play but leave them hanging. I love the setup of the Mousetrap. Hasn’t it been performed like a billion times? AC wrote it for the Queen, I think, didn’t she? I think it has a pretty interesting history. Yes it’s been performed many many many times. I’ve been going to our local theater more because of my daughter, but I don’t mind. I’ve really enjoyed them. We also Legally Blonde which was fantastic! I haven’t, but I should. The live theatre is such a great venue, and the senses perk up in a way they don’t in a movie theatre. I believe this kind of plot is called a “closed circle”, as explained in an episode of Haruhi Suzumiya. I haven’t seen any plays or musicals since I was a drug rep. I used to take physicians to one dinner theater as part of the whole social networking deal we had to do with them. It’s been a long while since I’ve seen any plays or musicals. In fact, I can’t remember what the last one was… Oh wait! It was the stage production of Dirty Dancing. That would be a great play to see! Plays (and live performances in general) always make me feel so inspired. Thanks for reminding me that I have to go see one soon! Cool! I don’t see musicals or plays often, but when I do, I really enjoy them. In the last five years, I’ve seen Jersey Boys and Billy Elliot. I saw Joseph and the Amazing Technicolor Dreamcoat with Donny Osmond many years ago and I absolutely LOVED that one. I agree, that seeing a live performance is amazing. We saw the animatronics production of How To Train Your Dragon, and it was like being INSIDE the movie. It was awesome. That sounds awesome, Heather! I’ve never heard of that. And I still haven’t seen Les Mis but I want to!!! This summer we went to an outdoor prodution of Shakespeare’s Merry Wives of Windsor–set it the old West. It was hilarious! I recommend taking a few acting classes to most writers. The research and methodology of learnng to embody another person helps characterization so much. It’s fantastic to be able to combine writer education/research with spending time with your children. My daughter is fascinated with storytelling and she’s really getting into dissecting movies/shows for story. It’s so fun we can do that together. Our local theater is doing Arsenic and Old Lace. It’s such a fun story and they did a fabulous job.